NSW Department of Education and Communities. (2011). NSW Literacy Continuum. NSW Department of Education and Training. 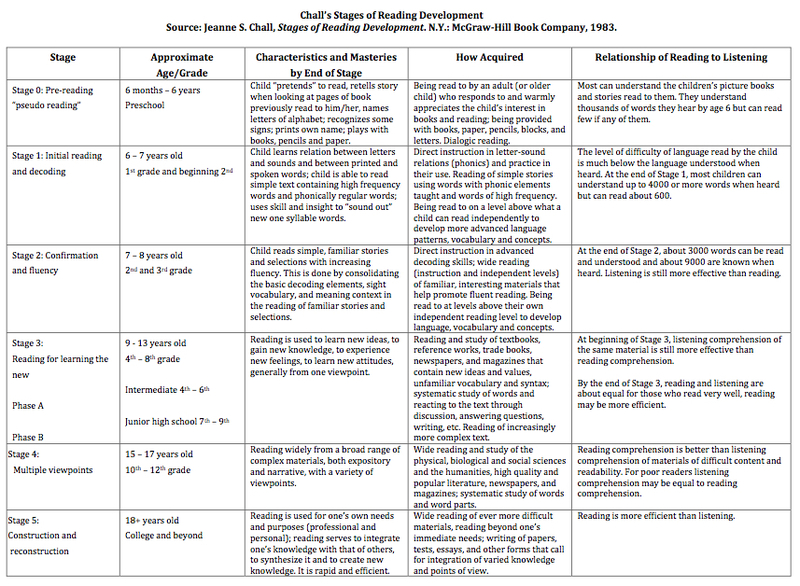 The following slideshow includes two images: (a) the six stages presented by Chall, and (b) a more elaborated account in the NSW Literacy Continuum. As can be inferred from the above, there is a progressive movement from an emphasis on "learning to read" to "reading to learn". The skills necessary to move across the stages are multifaceted and represented in the following sections. From page 8 of McKenna, M. C., & Stahl, K. A. D. (2012). Assessment for reading instruction. 2nd Edition. Guilford Press. Each of the skill domains (described below) is reflected in the image to the right (courtesy of McKenna & Stahl, 2012), which seeks to illustrate how the development of skills in these three areas must be developed in parallel if reading comprehension is to develop fully. The three skill domains presented in the diagram are as follows: word recognition/fluency (constrained skills), reading strategies/habits (intermediate skills), and knowledge/vocabulary/language development (disciplinary skills). Constrained skills include those skills which are necessary but not sufficient for full literacy, such print awareness, phonemic awareness, fluency and spelling proficiency (Paris, 2005). Constrained skills should be taught systematically and intensively and in relatively short periods of time with regular practice that build upon itself in a linear manner which can be assessed quantitatively. The development of constrained skills fosters literacy skills to the automatic levels necessary for comprehension and composition to take centre stage. Intermediate skills, on the other hand, include general habits of the mind (such as general comprehension, composition and learning strategies) as well as the development of general vocabulary and background knowledge. Intermediate skills include shared reading practices, writing workshops, scaffolded comprehension, explicit and incidental vocabulary development, and structured talk. These and similar techniques should instruct learners into the habits of good writers, readers and learnings and should be reinforced with sufficient practice in reading, writing and learning cycles. This levels also includes the development of conventional textual forms which are found in routine social environments. Disciplinary knowledge and practices, however, include the more specific discourses and knowledge practices that are often linked to the aims and objectives of different communities of practice. As Goldman writes, "comprehension instruction that focuses only on generic reading strategies ... falls short because comprehension itself becomes more complex and expansive as students mature and progress from grade to grade.” (Goldman, 2012, pg. 96 - 97) When we read and write in particular contexts, we must utilise the conventions of the fields of practice to make and express sense, whether this involves the domains of history or religion or commerce, etc. Disciplinary practices are complex in nature and draw upon a range of verbal and non-verbal knowledge. It is important to note how the balance of instruction in the three skills domain changes as one matures (or moves through the stages of development). It is essential that skills are progressively developed AND teaching practices evolve to extend skills and prepare learners for the increasing demands of schooling, work and civic participation. For disciplinary practices: Rich, scaffolded opportunities to meet the expectations of disciplinary practice, which includes a focus on effectiveness and critical reflection. Even though the three skill domains could be seen to be sequential stages, I would like to emphasise that each skill domain should be practiced to some extent at each stage of a reader/writer's development; however, the balance of such practice will be dependent on the developmental stage of the learner, as alluded to in the following diagram. For instance, it is important that a Year 1 student (READING STAGE ONE) has substantial experience developing mastery of constrained skills; however, that same child should have opportunities for rich, scaffolded interaction with reading, writing, speaking & listening (DOMAIN TWO) as well as apprenticeship in purposeful ways of using language, such as developing a class brochure for a kitchen garden and participating in presenting the daily weather report (DOMAIN THREE) (Au & Raphael, 2010). Likewise, a senior school student (READING STAGE FIVE) will be focusing on disciplinary practices in reading, writing and learning in science, social studies, art, etc (DOMAIN THREE). However, the same student should also be encouraged to reflect on general compositional practices and habits (DOMAIN TWO) as well as a refined morphology and syntax of the language (DOMAIN ONE). The table to the right also illustrates a significant point, which is as follows: at any given stage there should be literacy elements that we expect the individual to be able to complete independently as well as elements that individual can complete with guidance (e.g. prompting or scaffolding) and/or jointly with a peer or adult. The table also illustrates how we should also consider literacy elements that the learner can be exposed to and can participate in, but which the learner will not be asked to reproduce, such as appreciating the heights of language in a Shakespearean play or the diversity of artistic practice by visiting an art gallery. Such experiences should not be underestimated as they can go a long way in fostering positive attitudes and identities. Such experiences do not replace practice, though they can provide a relevant context for practice. Even though the balance of your pedagogy may change across time, it is helpful to consider consistent areas of practice to develop over the learner's lifespan. Even though the learner may be working in consistent areas of practice across such time, the degree of independence and complexity of practice will change across that time. Therefore, we must be mindful that the learner has scaffolded opportunities to practice and plentiful opportunities to exhibit, apply and comprehend new learning. There are some advantages conceptually of using consistent developmental areas across time. It is much easier to see developmental stages as opportunities to increase the complexity of skills and content, rather than imagining the need to introduce a distinctly different pedagogy for each developmental stage. It is true that teachers must require learners to exhibit increasing levels of independence and sophistication in their learning as time goes by. Teachers must become skilled at analysing the skills necessary in the areas mentioned at different ages whilst keeping a balanced approach to instruction. It is essential that experienced adults “keep the finger on the pulse” to ensure that younger learners are developing the skills, practices, knowledge, habits and attitudes that are required presently and which will be required in subsequent stages. This is particular important since each of the above elements must be coordinated if successful and critical reading comprehension is to develop over time. And the sequence of tables presented below (courtesy of Moustafa ) illustrate how a balanced instructional approach is one in which the development of all developmental areas are taken into consideration and are integrated for successful learning to take place. The following reminds us that no single instructional strategy or approach will develop skills in all areas. Therefore, teachers as well as parents and community members must be conscious of the balance of learning practices and experiences that will be necessary for comprehensive, rich and robust instruction to take place. Even though early learners require structured, sequenced training in literacy, teachers should also challenge the students to think critically through supported, scaffolded practices. For instance, we would encourage teachers to use the mode continuum (or the Language Experience Approach) in order to use structured talk to model genres of communication, practice content-area vocabulary and transition from oral to written modes of expression. Research finds that structure and challenge are key components of effective literacy and language instruction (Chall, Jacobs & Baldwin, 1990). Learners should have the opportunity to consolidate current skills (that they are expected to complete independently at the current stage) whilst experiencing more advanced skills (that they can complete through the assistance/scaffolding/modelling of an experienced adult). Too often literacy instruction will stagnate at one level without providing the instructional momentum for further stages of development.